The Tibetan Parliamentary Secretariat announced this week that starting from this year, March 10, the Tibetan National Uprising Day will also be observed as Tibetan Martyr’s Day. The decision to formally observe a Martyr’s Day to commemorate the sacrifices made by Tibetans inside and outside Tibet was unanimously approved during the Second Special General Meeting of the Tibetan People held in September 2012. The Tibetan Parliamentary Secretariat this week notified that starting from this year March 10 will be jointly observed as the National Uprising Day and Martyr’s Day. On March 10, 1959, Tibetans in the capital city of Lhasa rose up against the Chinese occupying forces, leading to the death of thousands of Tibetans and the eventual escape of the Dalai Lama to exile. Each year, Tibetans observe the day as the National Uprising Day all over the world. Last year on March 10, Gepey, 18-year-old monk of the Kirti Monastery in Ngaba, eastern Tibet set himself on fire near a military camp in the region. 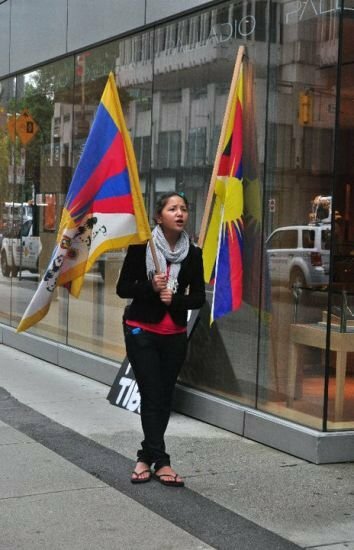 Since then, as many as 107 Tibetans have set themselves on fire protesting China’s occupation and demanding for freedom and the return on His Holiness the Dalai Lama. Announcing plans for the 54th Tibetan National Uprising Day in the exile headquarters of Dharamshala, the five major Tibetan NGOs, Tibetan Youth Congress, Tibetan Women’s Association, National Democratic Party of Tibet, Gu-Chu-Sum Movement, and Students For a Free Tibet, India held a joint press conference yesterday [5 March 2013]. The groups said a protest march will be held from the Tsug-la Khang right after the official function to Lower Dharamshala with protesters wearing black cloth around their foreheads. Representatives of the five major Tibetan NGOs addressing the press in Dharamshala on March 5, 2013. Local Indian and Tibetan leaders will be addressing the gathering followed by a signature campaign for Tibet. The organisers further appealed against parading of Chinese flags during the protest. Elsewhere in south India, a group of Indian supporters will be marching from the south Indian city of Mysore to Bylakuppe Tibetan settlement (around 80 kms) on the eve of the 54th Tibetan National Uprising day. “We hope to create awareness among fellow Indians about the plight of our Tibetan brothers, to go beyond nationalities and stand up for what is morally right, stand up for freedom and stand up for the oppressed to raise their voice against the oppressors,” organisers said.